The KMT government established by the victory of Chiang Kai-Shek’s Northern Expedition attempted to unify China and placate its population, facing many challenges in the process. was expanded to a total of 12,000 bureaus by the early 1930s; industrial output jumped by up to 10 percent a year; and in 1935 the silver standard was replaced with a managed currency. However, the combination of the stock market crash of 1929, the ravages of previous wars and an unreliable tax base meant that China’s economy saw an overall contraction during this decade. The trade deficit doubled between 1928-33. China’s tea exports shrunk – in 1902, the country had exported 34% of the world’s tea but by 1932 this was down to 9.8%.1. To combat economic decline, the Nationalists issued exceedingly high amounts of money, leading to inflation and the price of items multiplying by up to 28.7 million. controlling large parts of China – Sichuan and Guangdong were both run by local militarists, and warlord cliques frequently mounted new campaigns against the Nationalists, giving peasants what Fenby called “a sense of living in permanent crisis”2. Constantly supressing these military threats demanded resources, time and attention which could have otherwise been directed at state-building and assuaging the grievances of peasants. In the areas were Chiang did have control, he relied on the rural gentry to act as a local government, echoing China under the Qing. Economically, meanwhile, rural China was declared to be ‘bankrupt’ by economist Yao Hsin-ning. In 1933 average farm income, at $42, fell below average outgoings. 80% of peasants owned no land. 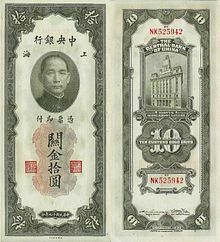 Flooding in central China in 1931 forced many to borrow money to buy food – lenders charged interest rates as high as 300% and 60% of foreign aid was taken by lenders as repayment. Tax burdens reached 50%, with most of it being syphoned by regional leaders and therefore not reaching the central government. In 1934-35 a famine struck rural China – although there was enough grain in the cities to feed the starving, the KMT government refused to ship it out to the country in case their rivals stole it on the way. There was some progress in education, with the number of secondary school tripling in 10 years – however, the state education budget was only 15% of what it needed to be to achieve the goal of free schooling for all. Health reform also lagged behind. By the mid-1930s, a population of 450 million had just 30,000 hospital beds and 5,000 doctors. Up to a quarter of rural deaths spread through the use of excrement as fertilizer – however, fertilizers were only imported, and therefore too expensive for most peasants to afford. Meanwhile, the Nationalist government used opium for revenue, with the take from opium exceeding $100 million by 1934. Opium addiction thus remained high, with up to a third of the population of Yunnan thought to be addicted. China did not see a large degree of modernisation during the Nationalist decade – the number of workers in modern factories was still only 1.5-2 million (out of a population of 450 million) and traditional handicrafts were thought to make up around 70% of the manufacturing sector. Falling prices caused by Japanese competition led to the cost of labour in parts of southern China falling by 70% between 1930 and 34. Some wages fell to only 6% of the market price. The Nationalists were often ready to leave the regulation of labour to criminal gangs which would repress worker discontent and therefore prevent the rise of leftist trade unions (where the regime feared the CCP would gain influence). Therefore despite official legislation that gave women maternity leave with pay, new mothers got an average of $18 with no time off, while the eight hour work day remained unachieved. 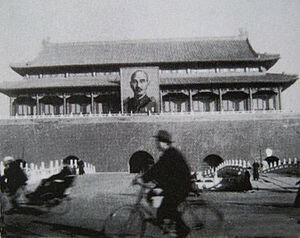 Chiang’s government attempted to repress criticism and revolutionary sentiment by placing strict controls on creative production. Between 1929 and 1935, 458 literary works were banned for slandering authorities, encouraging the class struggle or constituting ‘proletarian literature’. Intellectuals were further repelled by the introduction of Chiang’s ‘New Life Movement’ on 19 February 1934. This campaigned aimed to ‘create a citizenry that was self-aware, politically conscious, and committed to the nation’, attempting to instil social decency, right conduct and self-respect. Soong Meiling described it as ‘a direct attempt to complete with the Chinese platform of economic and social reform, substituting a retreat to Confucius for an advance to Marx.’ 96 rules that were to govern all conduct were introduced, based on Confucian values such as filial piety. Many of these were seen as arbitrary and beside the point in a time of national crisis, such as the ban on women walking male dogs in the streets or stipulation on the length of skirts. Resentment towards the Movement was deepened by the fact that many of the KMT’s officials glaringly ignored it, enjoying wine, women and gambling, and even Chiang’s wife smoking a pipe despite one of the rules prohibiting the act. This sentiment was echoed in the North China Daily News, which observed that ‘the New Life Movement would have its best chance of success if it could begin at home’. In March 1929 a Party Congress whose delegates were selected by Chiang himself decreed that the KMT should practice ‘political tutelage’ on behalf of the people until the end of 1935, meaning that no elections would be held. 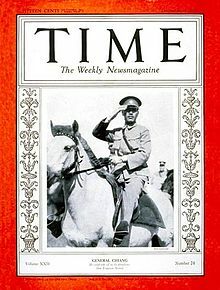 The regime also turned to fascist tactics, with Chiang declaring that ‘Fascism is now what China most needs’ in 1935. A secret police of sorts was established, whose 14,000 members swore an oath to advance Chiang’s supreme leadership by any means including violence. Between 1927 and 1937, 24,000 Communists and 155,000 left-wing sympathisers were arrested and ‘reformed’ (subjected to hard labour or torture). returned. However, continued antagonism by Japan proved a difficult challenge for the Nationalists to handle. On 18 September 1931, Japan forcibly took over 3 of China’s northeastern provinces, in what was termed the Mukden Incident. 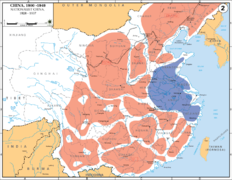 Chiang offered no military resistance, and on 9 March 1932 the independent state of Manchukuo was declared, effectively constituting a puppet Japanese government in Manchuria. The land and resources lost during this incident and the later Tanngu agreement of 31 May 1933, in which Japan ordered Chiang to remove Chinese troops from an area of 115,880 square miles in China’s northeast as a price for not attacking Beijing, constituted a massive financial loss for the Nationalist government. The Tanngu agreement alone cost Chiang $8 million a month in lost duties. Historian Jonathan Fenby argues that the Nationalist government did not mount a resistance to this Japanese takeover because they feared that a patriotic crusade to recover Manchuria could create the kind of mass nationalistic movement it distrusted and therefore weaken its hold on China.